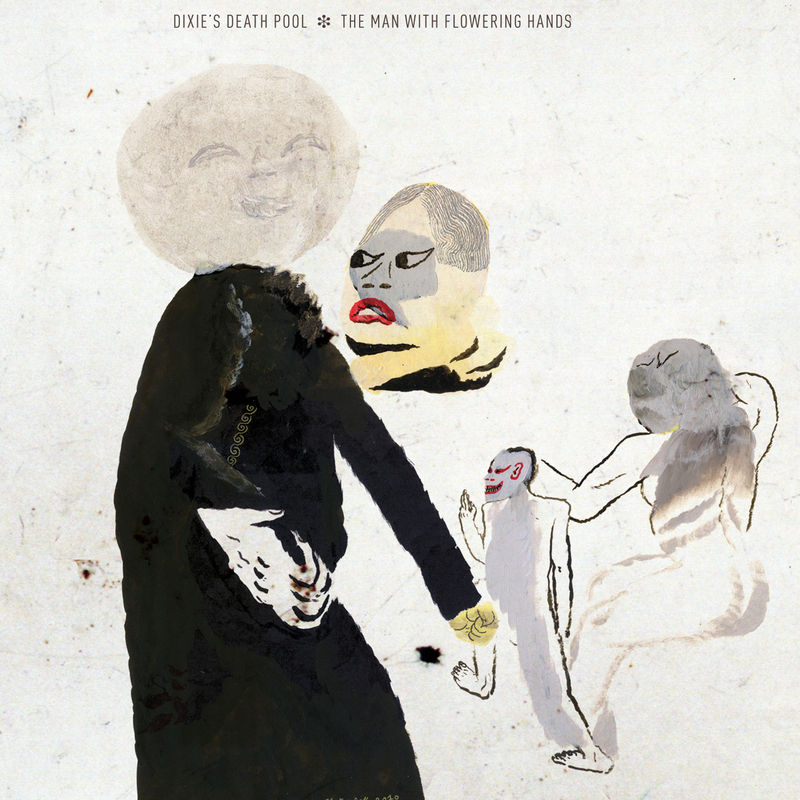 Continuing in the vein of earlier Dixies Death Pool releases, "The Man With Flowering Hands" is an incredibly detailed and immersive sonic journey, twisting like a David Lynch soundtrack, or the more experimental moments of Tom Waits' Bone Machine. Opening with the intimate and epic splendour of "Sunlight Is Collecting On My Face", the album immediately engulfs the listener in a swirling fizz of stratospheric synthesizers, electronics, bells, harp, violin, piano, organ, and xylophone. This painterly orchestration is wrapped around the simple hazy strum of an acoustic guitar, brushed drums and upright bass. Dixie's Death Pool albums are not the product of a band so much as that of a producer, orchestrating and configuring an ever changing cast of musicians. While the music is for the most part written, recorded, and mixed by Lee Hutzulak in his Vancouver home studio, "The Man With Flowering Hands" features creatively vital contributions from: Meredith Bates, Frederick Brummer, Toby Carroll, Coat Cooke, Katie Dey, Lief Hall, Madoka Hara, Todd Hutzulak, Shane Krause, Stephen Lyons (Fond of Tigers), John Mutter, Michael Priebe, Igor Santizo, Russell Sholberg, Kim Stewart, and Rachael Wadham. With the exception of a few songs the music was completely improvised and recorded in the moment. Over the course of a few years the full scope of the album was realized through a process of asking "what if" a lot, and experimenting with overdubbing, mixing, remixing, recording and rerecording. Session by session the images begin to form. Traditional instruments, electronic noise, malfunctioning gear, homemade percussion, repurposed junk, foley sounds and field recordings are all seamlessly woven into a fully rendered, utterly unique fantasy world. At the very core of this is an acoustic guitar and a songbook that sings like a cinematic, surreal vision of the Gothic Western. Lee Hutzulak's music strikes a balance between electro-acoustic improvisation and acousmatic musique concrète, focusing on texture, tone and space. In folding the art of foley (movie sound effects) into music performance, Hutzulak continues to explore all manner of extended technique. Some of his more unusual tools include a frying pan harp with springs for strings, a 6ft tall spinning card rack on wheels, a large metal shelf played with a scrub brush, Styrofoam and elastic bands. While studying drawing at the Alberta College of Art in the early 1990s Lee's interest in sound art and music performance was sparked and has since manifested itself in a growing number groups he plays with. Both solo and in small ensembles, for theatre, dance and music, Hutzulak enjoys playing in some of Vancouver's more intimate venues. Since 1991 he has been piecing together sound studios to record music and sounds with friends.